New this school year is that driver and attendant evaluations will no longer be done on paper. Instead they will be prepared by supervisors and acknowledged electronically. The online system allows an employee to make a comment related to their evaluation. The following documents will be helpful in navigating this new evaluations process. Click on the links below to download each document. 2018-2019 School Year: Operational Procedures for School Delayed Opening / Closing / Early Release Due to Inclement Weather, Power Outages, Road Closures, Environmental Hazards or Other Emergencies. The 2018 Pupil Transportation Handbook establishes guidelines for the workplace and includes information such as Operational Procedures, Personnel Policies, Emergency Procedures, etc. 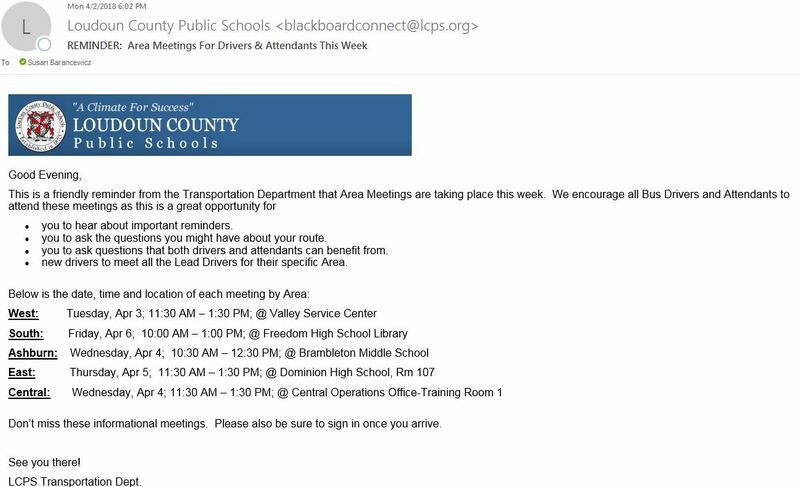 To get a copy, you can either use a network computer and download the document from the LCPS Intranet or you can click here to download a copy. Please consult the Recertification Schedule for the class or classes that suit your needs. When signing up for a recertification class or a CPR and/or First Aid class, send your registration form to Transportation-Training Office. You can send it by courier from any school or by fax to 703-779-8965 Attention: Training Office. A delay in registering could mean you won't get into the class of your choice. You will only be contacted if the class is full or cancelled. Please mark your calendar for your date, time, and location. Should you need assistance in determining which Module(s) you need, please contact the Training Office at 571-252-1720. Classes are held at 42000 Loudoun Center Place, Leesburg, VA 20175. All bus drivers and bus attendants are required to have their certifications up-to-date at all times. Please consult the Recertification Schedule for the class or classes that suit your needs. When signing up for a recertification class or a CPR and/or First Aid class, send your registration form to Transportation-Training Office. You can send it by courier from any school or by fax to 703-779-8965. Attention: Training Office. A delay in registering could mean you won't get into the class of your choice. You will only be contacted if the class is full or cancelled. Please mark your calendar for your date, time, and location. Should you need assistance in determining which Module(s) you need, please contact the Training Office at 571-252-1720. Classes are held at 42000 Loudoun Center Place, Leesburg, VA 20175. Click on the link below for a downloadable PDF. Click the links below to access information or download a form. Tablet presentation by Linda McNeil on 09/08/2017. Click on a route posting number below for information about the open position. Please read postings carefully. Check back weekly for new listings. To apply for an open position, please follow the instructions provided at the bottom of each posting.